During the winter months of 2018, I often found myself playing with paint in the studio. I made time to practice each week, invested in new brushes, and even took an intro to alcohol inks class at Greenville Center for Creative Arts in March. I’ve been inspired by the medium! 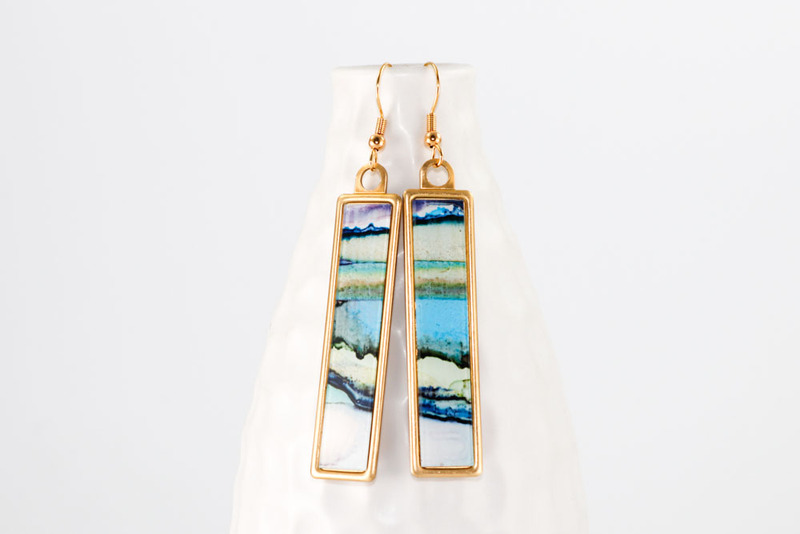 The textural and graphic possibilities of paint have greatly influenced my new jewelry collections this spring. I’m excited to finally share these new additions to my Etsy shop with you. Each piece is an original one-of-a-kind, but thanks to the simple settings and delicate scale, they’re easy to incorporate into your everyday-style. See the process in my new Maker's Eye View video on YouTube! Alcohol Ink Collection: drips and splatters showcasing beautiful unpredictable patterns in colorful dyes, frozen in time on clear acrylic. Mixed Media Collection: clear acrylic layered with crumbled gold leaf, pale pink paint with stark black accents, framed in a variety of simple metal bezels and laser etched wooden settings.